What do we mean by “Sub-National” divisions in NIPN countries? The generic term “Region” is equivalent to the “Sub-National Administrative Level N-1”, which typically splits the country into 10-20 sub-divisions. The generic term “District” is equivalent to the “Sub-National Level N-2”, which typically splits the country into 30-100 sub-divisions. “Region” is used as a generic term in the tool for “Sub-National Level 1”. The notable exception is Côte d’Ivoire where “Region” actually refers to “District”. National dashboards have been produced for the SUN countries. Sub-national dashboards are currently being produced, which are slightly different and designed to compare data across districts. Clear sub-sections that correspond directly to the SUN Theory of Change and also align in many respects with the UNICEF and Lancet nutrition frameworks. Indicators with “no data” appear clearly (although not shown in this example). Most recent year of when the indicator was collected is included. Colour coding clearly shows performance compared with median performance of other countries (or national median for sub-national dashboard). Sub-national dashboards that are not yet fully finalised are colour coded to compare one region with another. A summary narrative is included. A page to explain the colour classification is included. 6 pages in total for national dashboards; 8 pages for initial draft sub-national dashboards (not yet published). Very clear and simple bar chart with average of the district and average of the state. One issue with this sort of bar chart is the scale as it is difficult to compare indicators ranging from 10 to 20% with those ranging from 40 to 50%. Indicators with “no data” appear clearly. A section with “Possible points of discussion” is included. An information system is a system of interrelated components that work together for collecting, processing, storing and disseminating information amongst stakeholders/beneficiaries to support decision-making, coordination, control, analysis and visualization (e.g. DHIS-2; National Statistics Office repository; DHS platform). A dataset is a file that contains all the individual records of one specific survey (e.g. DHS survey in country “X” of 2005). A dataset can be available in one or more information systems. For example, the Niger DHS survey of 2012 can be found in the STATcompiler information system (DHS official platform) and in the information system of the National Statistical Office of Niger. An indicator is calculated based on one or more variables from a dataset. The definition of the indicator is not exactly the same. For example, the definition of some indicators of DHS surveys have evolved over time. The survey sampling methodology is different. Work with the data analysts to gain a picture of the magnitude and trends of the undernutrition problem: it is recommended that DHS and any other prevalence point from validated national surveys are used. Draw the scenarios 1) if trends continue as usual, and 2) if national targets are to be met. This exercise is to be repeated at the sub-administrative level (region, district) at which the NIPN cycle ‘questions-analysis-findings’ is strategically interested in focusing on. As data allow to do so, the NIPN cycle should strengthen the decentralized decision-making level as much as possible, and thus the questions identified also respond to that level. 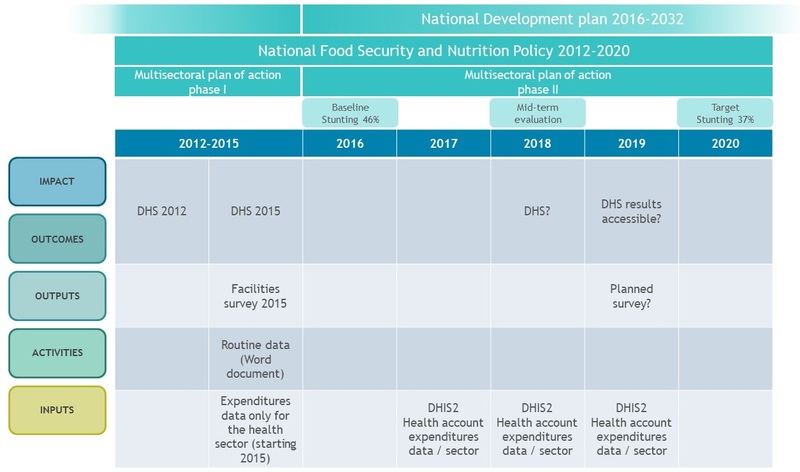 Present visually the main multi-sectoral policies and plans in relation to the undernutrition trend and consider how the trend evolved during the implementation period. Do it for the most relevant policies, programmes and/or changes in investment in nutrition that are believed to have occurred in previous years. At formulation stage, the focus will be on the definition of targets, the selection of interventions, the required coverage, etc. During implementation, the priorities will be around progress of implementation and probability of reaching targets. At evaluation, the focus will be on impact: what worked, what did not. Each stage represents a strategic opportunity to improve the next one, should the corresponding information be available to decision makers. The assumption is that if the multi-sectoral policy, plan or programme is well designed, and the interventions are implemented 1) according to planned coverage and 2) with the desired quality, an impact should be seen on the intended outcome. 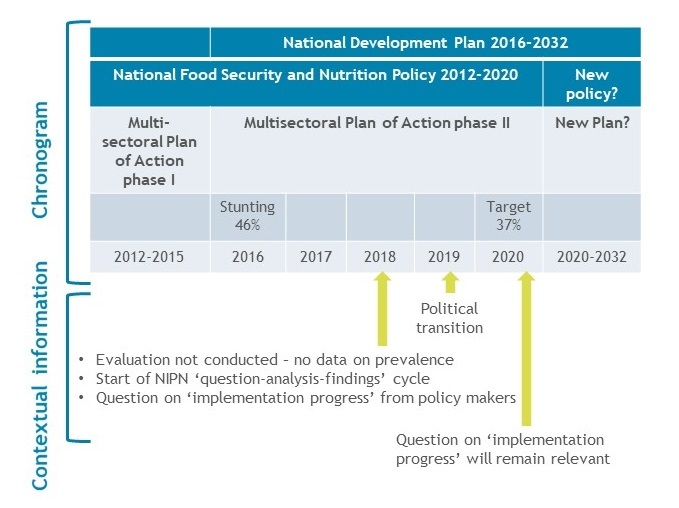 Visualising the implementation period of the policy, plan or programme in relation to the undernutrition trend will provide an initial idea of the probability of these assumptions being correct. Display the implementation periods of the multi-sectoral policies, plans and programmes on one timeline. Add complementary information on the context of implementation, as shown in the fictional country example below. This chronogram can help to confirm the priorities of policy makers for the next 12-24 months and will help to identify possible windows of opportunity for influencing planning, formulation or evaluation cycles. 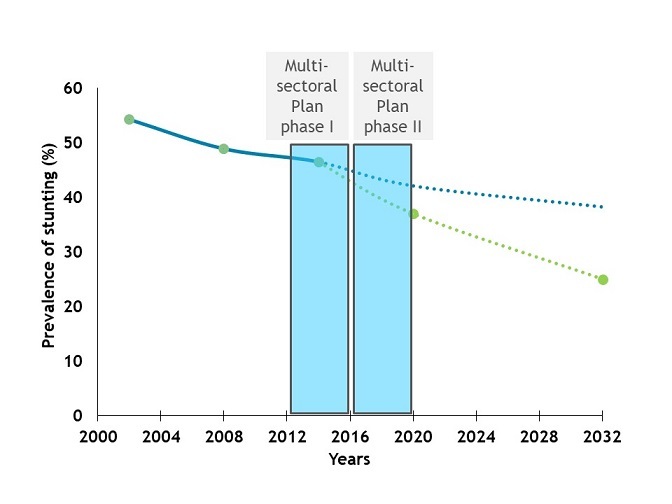 The fictional example below shows that policy makers in this country need information in 2018 on the progress of implementation of the Multi-sectoral Plan of Action, phase II, and the probability that the plan will achieve its targets by 2020. The absence of a mid-term evaluation makes this information need, which can be filled by NIPN, more acute. With an upcoming political transition in 2019, the new policy makers will also need information regarding ‘implementation progress’ to inform the formulation of new policy by 2020. NOTE: The relationship between multi-sectoral and sectoral policies or plans can be presented visually in a similar way, to identify whether the latter could offer an entry point to strategically supporting multi-sectoral efforts. 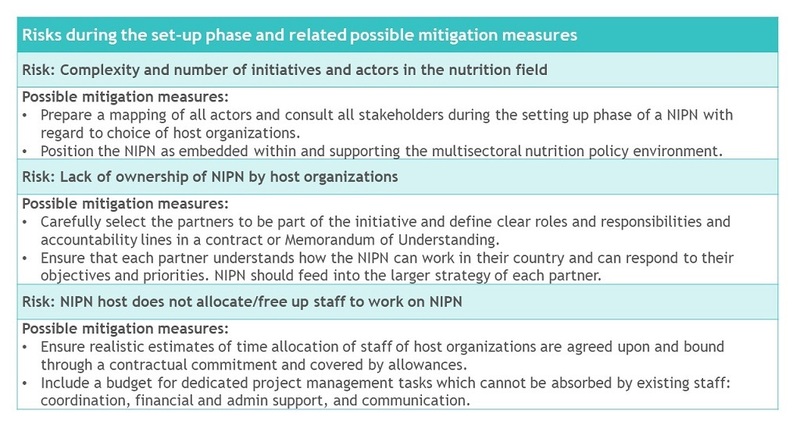 NIPN is unique in that it brings together and values multiple data sources shared by the various sectors that influence nutrition: health, agriculture, water, sanitation and hygiene, social protection, and education, among others. Demographic and Health Surveys (DHS); Multiple Indicators Cluster Surveys (MICS); National Nutrition Surveys (NNS); Household Incomes and Expenditures Surveys (HIES); Health and Nutrition Expenditures Surveys (HNES); Services Availability and Readiness Assessment (SARA), etc. Nutrition Surveys (SMART); Household surveys; Intervention coverage surveys, etc. Global initiatives using modelling techniques provide data at national and sub-national levels: NCD Risc (http://www.ncdrisc.org/index.html) or IHME for Africa (https://vizhub.healthdata.org/lbd/cgf#). This list is not meant to be exhaustive. Each country should explore the wealth of information available. The data landscape exercise is useful for this purpose (see section 3.1). Using national survey data from DHS and MICS, a trend analysis can be used to estimate the Average Annual Reduction Rate of stunting (see section 3.6). The same method can be applied to other target indicators. What is the current trend of stunting reduction? 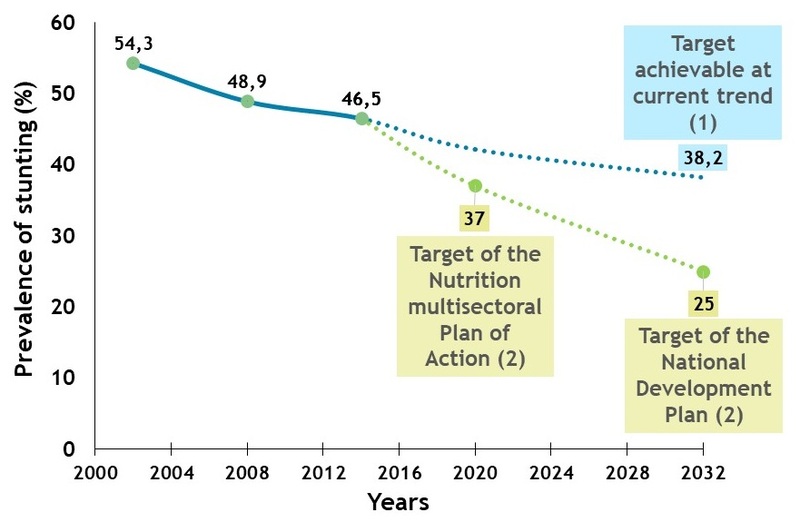 Has the reduction of stunting accelerated over the period of implementation of the last Multi-sectoral Plan of Action for Nutrition? 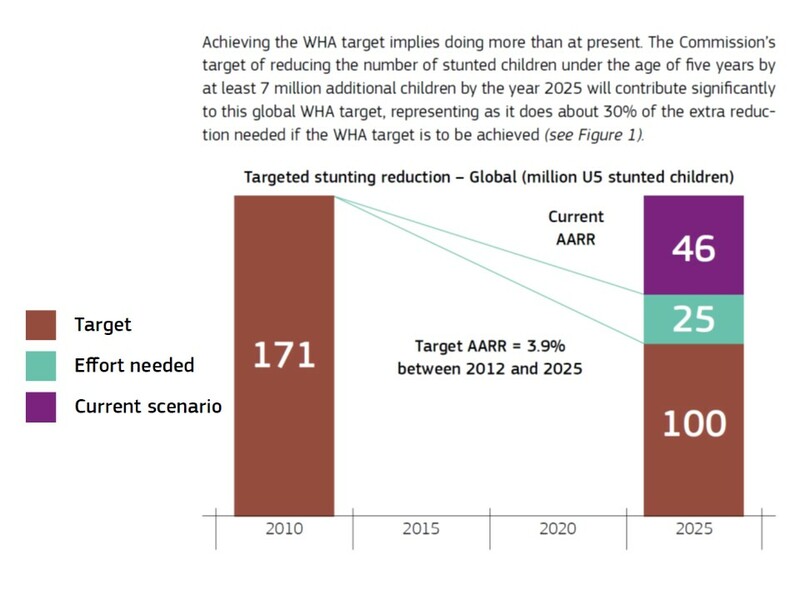 Is the current trend in stunting reduction sufficient to reach the target? This analysis carried out at global level shows that the current AARR is not sufficient to achieve the planned target of 2025. This Venn diagram shows the population affected by one or more forms of malnutrition. It is taken from the Global Nutrition Report, which analysed national level data. 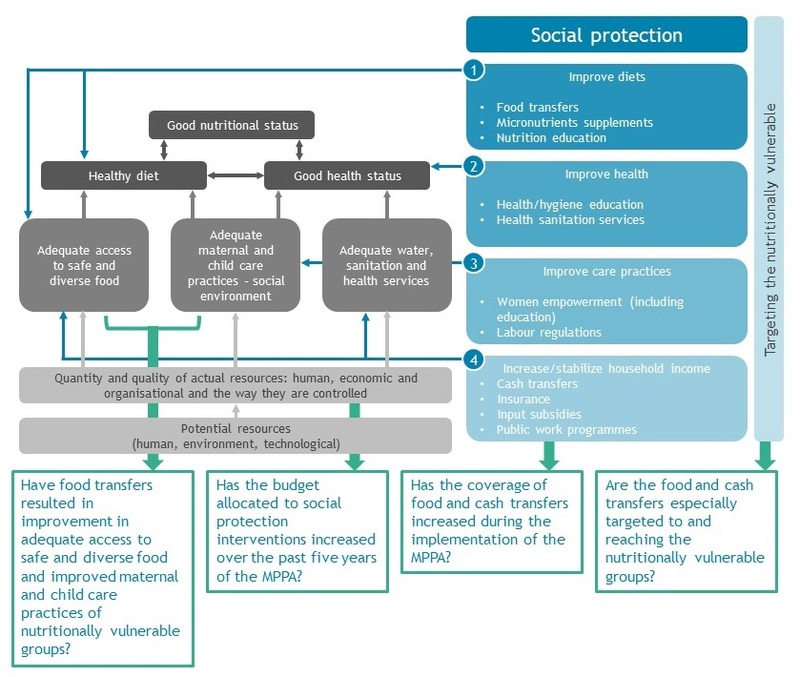 Similar analysis can be carried out at sub-national level to show which regions are affected by which forms of malnutrition and what actions are needed. It allows the issue of the double burden of malnutrition to be highlighted. The same figure with the actual number of children affected by region can highlight where to invest. A National Food Assistance programme has been implemented in Mexico for decades. In 1994, a descriptive analysis of the levels of incomes of the beneficiaries of the programme showed that the programme was not very effective at targeting the poorest households. After active measures were taken, the same analysis showed that in 2000 a much greater proportion of the programme’s beneficiaries were indeed those with the lowest incomes. Source: Levy, S. (2006). Progress against Poverty. Sustaining Mexico’s POP Programme. Washington, DC: Brookings Institution Press. 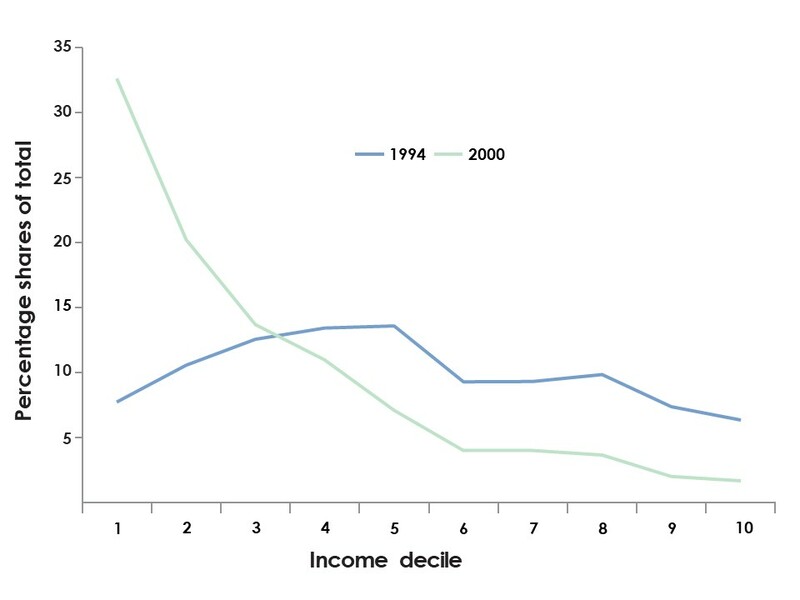 In 1994, less than 10% of the beneficiaries belonged to the lowest income decile. In 2000, more than 30% of the beneficiaries belonged to the lowest income decile. 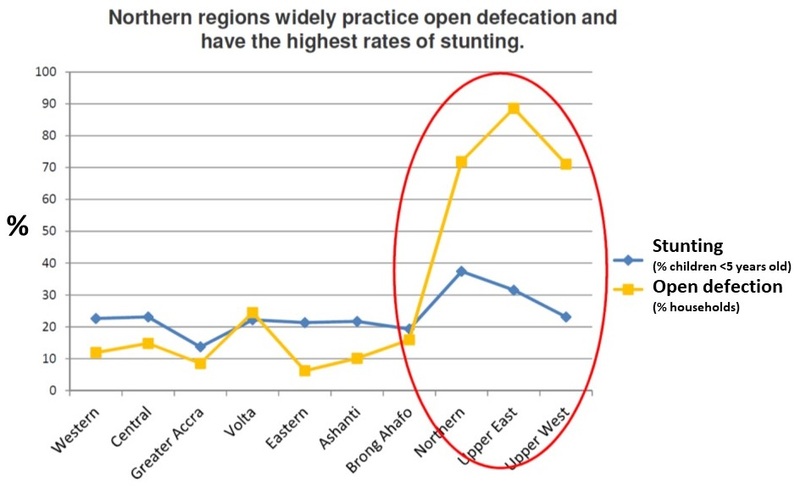 A descriptive analysis looking at regional disparities shows that the three regions with high levels of stunting also have high levels of open defecation practices. This can be a starting point to further investigate why open defecation is high in those three regions and whether other determinants are also showing high levels. Iron-folic acid supplements are delivered through health services. This combined data suggests that most districts with low levels of iron-folic acid supplements also have low ANC visits coverage, suggesting an issue with access to health services. But it also shows that quite a few districts with good ANC visits coverage also have a low coverage of iron-folic acid supplements, suggesting issues with delivery. Further investigation can provide interesting insights into what is needed to improve the coverage of iron-folic acid supplementation. 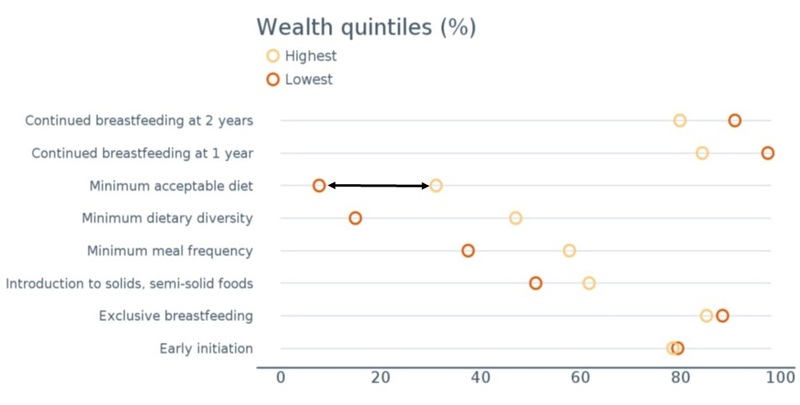 This equity analysis of child feeding practices shows that some practices are more sensitive to the levels of incomes (minimum diet diversity) than others (early initiation). Equity analysis is useful for determining whether the progress achieved is benefiting all and, in particular, the most vulnerable. If most of the progress is only observed in households with higher incomes, this suggests a problem with the targeting or design of the interventions. It must not be an intermediate step in the causal pathway between the study exposure of interest and the outcome. Example: Has investment in programme A led to reduced anaemia levels? lower malaria incidence in the intervention area due to reduced rainfall during the baseline measurement. Without controlling the data analysis for confounding factors, it is not possible to attribute the reduction of anaemia levels to the nutrition intervention. While measuring an association and checking the temporality is relatively easy, controlling for all (known and unknown) confounding factors is very challenging, as data on all confounding factors is often not available in population-based surveys. This typically requires a randomised controlled trial in a research setting to measure and compare rates of anaemia and numerous potential confounding factors between the intervention group and a control group (not exposed to the intervention), before and after the intervention. National population-based surveys and routine monitoring data typically do not have a control group. Without a control group, trying to interpret an association or a causal relationship can be very misleading. There is a high risk of drawing an incorrect conclusion, such as the nutrition intervention having an impact on anaemia while in reality a confounding factor has caused the change in anaemia rates, and not the nutrition intervention. Data from this type of survey is not suitable for the analysis of a causal relationship and could lead to incorrect and misleading policy decisions. This randomised controlled trial measured the impact of an intervention that was designed to reduce stunting. the stunting levels of the intervention group remained almost stable. It is only by comparing the delta of pre- and post interventions for the control group and the treatment group that a robust conclusion can be reached: the intervention reduced stunting levels by 6.4 percentage points (74.8-68.2) – (64.3-64.1). 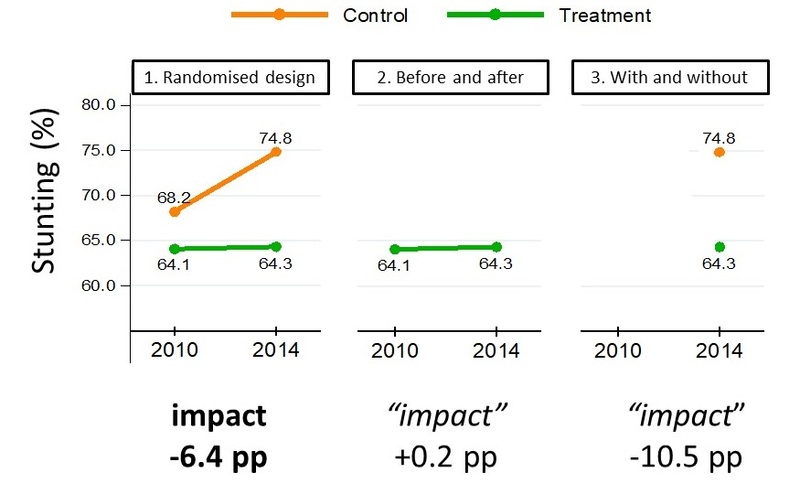 Without a control group, the measurements “before and after intervention” for the treatment group could be compared, leading to the conclusion that the intervention had no impact (increase of 0.2 pp). Without baseline measurements, the populations “with and without” interventions could be compared, leading to the conclusion that the intervention had a very high impact (reduction of 10.5 pp). In the last two cases, an incorrect conclusion has been reached. 1. Why a data analysis plan? The method for creating a data analysis plan in the context of a NIPN is not much different from the method used in a research context. A data analysis framework is already produced (step 3 of question formulation process) and forms the basis for the more detailed data analysis plan (after step 4 of question formulation process). In section 3.4, pages 7 to 9 data analysis methodologies are described. NIPN is about the use of existing data, it is not about designing a protocol for new data to be collected. The next section describes briefly the content of a data analysis plan focusing on what is a bit specific to the NIPN. Centers for Disease Control and Prevention (2013) Creating an analysis plan. Atlanta. Simpson, S.H. Creating a data analysis plan: what to consider when choosing statistics for a study (2015). 2. What is a data analysis plan? At this stage, the policy relevant question (and, in some cases, its sub-questions) is already well defined (section 3.4, page 11). Answering all the sub-questions will provide a full answer to the main question. The dataset(s) needed is(are) listed. In the context of the NIPN, particular attention may be needed on data management: as the dataset(s) may come from different sources and/or may not have been designed for the main question, there could be quite some work to be done to harmonise / append / clean the raw dataset(s). Is there a need to transform the data for the analysis? To answer these question, you need to have accessed the datasets in question. In this section population sub groups, geographic scope, timeframe… are very precisely defined. You also need to clarify the data quality level required for the analysis. Indeed, depending on the analysis, you may need to be more or less strict on data quality level required. This is detailed in the Data Quality training module (section 3.3). In this section you define precisely variables/indicators to be used in the analysis. For example, if you analyse “obesity”, you need to precise if you refer to the Body Mass Index (BMI) and if you are going to use different categories of BMI or the mean or both. In the context of NIPN, the harmonization of the definition of indicators across datasets will be important. Ensure coherence with section 4 of the guidance notes on data analysis. Also, to provide only undisputable analysis (principle 3 section 3.4, page 4), make sure that the statistical method used is coherent with the datasets available and the data quality of these datasets. The choice of the statistical method is key to avoid overinterpretation of the data that could lead to misleading conclusions. Does the NIPN team has the technical capacity to handle the statistical method and the software identified? At this stage, a precise estimation of the time and resources needed to conduct the analysis should be made. If this estimation lead to more time than the initial estimation made during the data analysis framework, you may adjust the question/s to be addressed first. Question 1: What is the spatial distribution of obesity and overweight in Bangladesh? Who are the most affected groups? The underlying objective behind this question is to be able to improve targeting of the intervention. WHAT are the characteristics of a well-formulated policy question? 1. The question must respond to a relevant policy need The policy relevance is ensured by going through steps 1 and 2 of the question formulation process. 2. The question must be answerable with existing quantitative data Data experts need to identify the main datasets available that measure this indicator. Population-based surveys seem to be a good source of data for this question. Modelled data also exists on BMI (www.ncdrisc.org) that can help answer the question. This has pros and cons that need to be carefully balanced when developing the data analysis plan. 3. The question must provide a timely answer for policy use The timeliness of the answer is discussed during steps 1 and 2 of the question formulation process. Note that only the data analysis plan will be able to define precisely the time needed for the analysis. 4. The analysis of the question must lead to actionable recommendations and decisions This is ensured by going through steps 1 and 2 of the question formulation process. e) the expected outcomes a) The age groups need to be specified: Adults? Children? Adolescents? All? The data analysis plan will specify what is meant by “most affected groups”. Region? (need for representative data at sub-national level). Use the data where it is actionable. If decisions are taken at regional level, it makes sense to use regional subgroups. A brief literature review can help to define those groups in the context of Bangladesh. The data available can also limit the choice of the groups. b) This question is about a nutrition target, not a specific intervention. c) The underlying “policy objective” could be made more specific as this would guide the development of the data analysis plan. d) The question seems to suggest looking at the most recent data. If data is only available for 2005, is the analysis still relevant? The time frame can also be chosen based on official targets, or a strategic year for the launch of a new plan. e) BMI is usually used as the outcome indicator of overweight and obesity. The data analysis plan will detail whether the analysis will use categories of BMI or the mean BMI as the outcome indicator. 6. The question must imply data analysis methods which are suitable for use with the NIPN approach The question implies the use of a descriptive data analysis method. The data analysis plan should detail the methods to be used, e.g. t-test to compare mean BMI among the different groups, or a graphic display of the mean BMI with confidence intervals. Question 2: What are the determinants of stunting by region? 2. The question must be answerable with existing quantitative data Data experts need to identify the main datasets available that measure stunting and determinants of stunting. Population-based surveys seems to be a good source of information for this question. e) the expected outcomes a)Need to specify the age groups: Children? Adolescents? All? b) This question is about a nutrition target and determinants, not a specific intervention. d) The question seems to suggest looking at the most recent data. If data is only available for 2005, is the analysis still relevant? The time frame can also be chosen based on official targets or a strategic year for the launch of a new plan. e) Stunting is the outcome indicator. The data analysis plan will detail whether the analysis will use prevalence of stunting (global or severe or both) or the mean Height- for-Age Z-score as the outcome indicator. The data analysis plan needs to describe precisely which “determinants” should be included in the analysis. 6. The question must imply data analysis methods which are suitable for use with the NIPN approach The question implies the use of causal data analysis methods which do not lend themselves to the NIPN approach, as causal analysis using population-based data can be disputed and may not lead to actionable recommendations. Knowing that the levels of education, income, diarrhoea and exclusive breastfeeding are associated with stunting does not bring new information. A stronger association between one determinant and stunting in one region than elsewhere does not necessarily imply that this determinant should be a priority for intervention. Idem, in case a determinant is not associated with stunting. 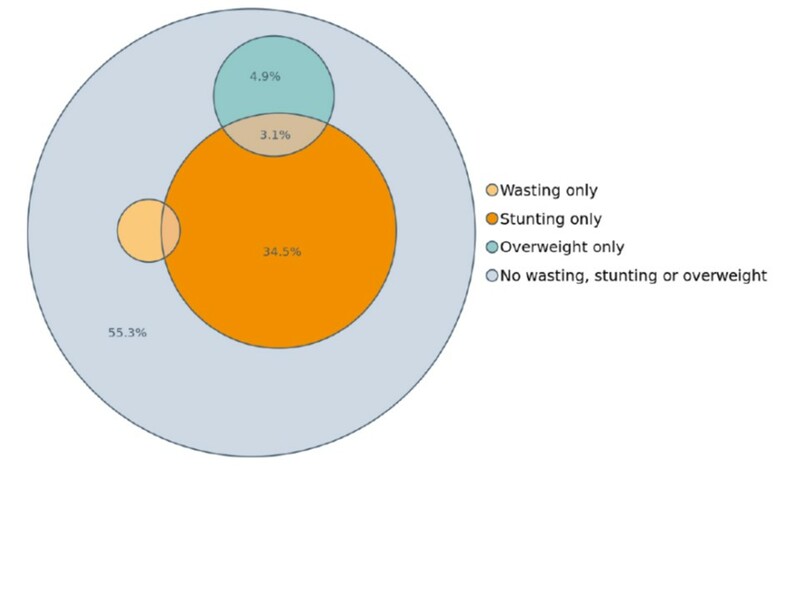 However, reformulating the question as follows: “What is the magnitude and severity of the prevalence of known determinants of stunting by region?” allows for descriptive analyses which are well suited here, and may lead to actionable recommendations and partly answer the policy objective. Comparing determinants as well as coverage of nutrition interventions between regions can lead to even more interesting recommendations. 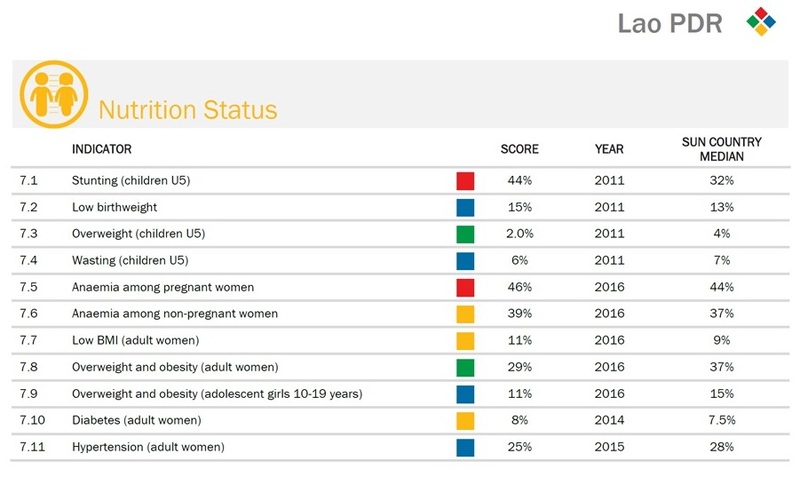 A sub-national nutrition dashboard could be helpful here (section 3.2). Question 3: Have investments (input) in WASH interventions (activity) led to better access to WASH facilities (output), resulted in a reduction in % of children suffering from diarrhoea (outcome) and reduced child undernutrition and mortality (impact)? 2. The question must be answerable with existing quantitative data Data experts need to identify the main datasets available that measure the indicators mentioned. Budget data, routine data, monitoring of progress indicators, and population-based surveys seems to be a good source of information for this question. e) the expected outcomes a) “Children”: age groups must be specified, for instance, 0-59m or 6-59m of age. b) This question is about an intervention in the WASH sector, but the exact interventions need to be described more specifically. c) The underlying “policy objective” could be made more specific, as this would guide the development of the data analysis plan. d) The question does not specify the time frame. Is it based on the time frame of the official action plan on WASH intervention? e) Diarrhoea is the outcome indicator. The data analysis plan will detail whether the analysis will use prevalence or incidence of diarrhoea. The data analysis plan needs to describe precisely the other indicators that should be included in the analysis (WASH indicators, but also impact indicators, namely stunting and mortality). Have investments in WASH interventions changed over the past five years? Has coverage in WASH interventions changed over the past five years? These questions can be answered by suitable descriptive data analysis methods using existing data. The last part of the pathway regarding the impact of repeated diarrhoea episodes on stunting can be tackled with a literature review and/or using a modelling tool such as LiST. Question 4: How much impact can we achieve with nutrition-specific interventions on stunting? 2. The question must be answerable with existing quantitative data Data experts need to identify the main datasets available that have estimates on stunting and coverage of nutrition-specific interventions. e)the expected outcomes a) Need to specify the age groups: Children? Under-two or under-five? b) The data analysis plan needs to specify the list of interventions that should be part of the analysis. 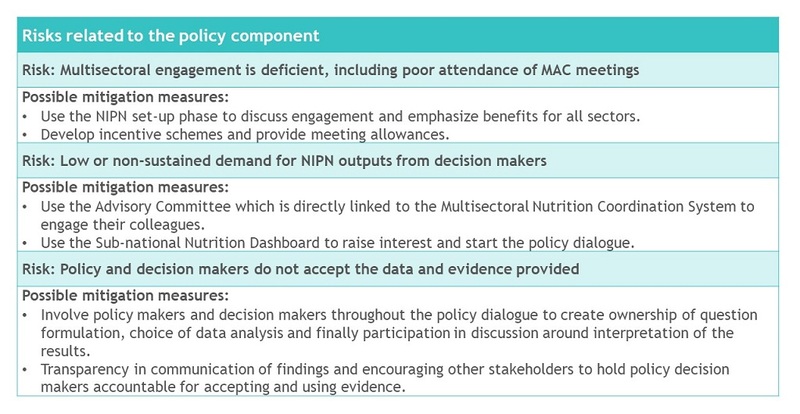 The list of Essential Nutrition Actions or the interventions prioritised in the Nutrition Action Plan can be used. d) The time frame is not very precise. Is it based on official targets (e.g. 2025)? e) Stunting is the outcome indicator. The data analysis plan will detail whether the analysis will use prevalence of stunting (global or severe or both) or the mean of the Height for Age Z-score. The data analysis plan needs to describe precisely the coverage indicators that should be included in the analysis. 6. 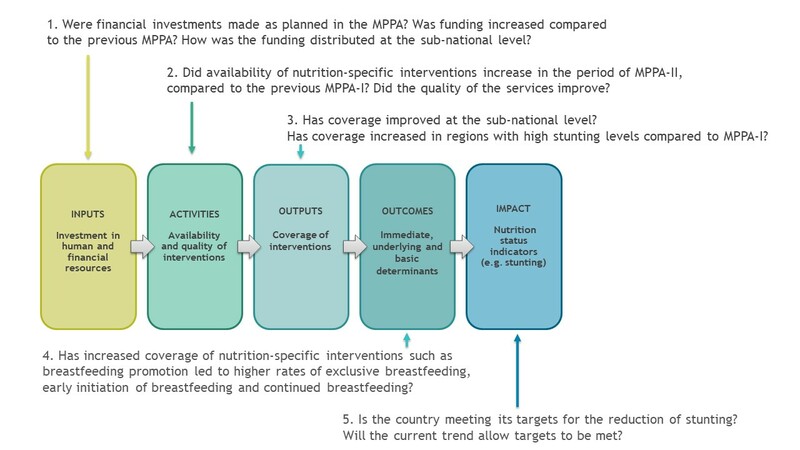 The question must imply data analysis methods which are suitable for use with the NIPN approach The question implies the use of causal data analysis methods which are not suited because population-based data cannot provide a robust measure of the effect of an intervention on stunting, since there is no comparison possible with a control group. However, some research studies have measured the effect of interventions on stunting, especially nutrition-specific interventions, and, on the basis of these studies, LiST has modelled how a coverage increase of nutrition-specific interventions may result in the number of stunted children prevented. LiST requires data on the coverage of interventions. In Guatemala, a Steering Committee provides clarity and transparency on plans and arrangements to the main NIPN partners. It comprises representatives of the EU Delegation, as the main donor supporting the NIPN; the Secretariat for Food and Nutrition Security (SESAN), as the government host for the NIPN; and CATIE (Centro Agronómico Tropical de Investigación y Enseñanza), as the organisation managing the grant and providing technical assistance. The Steering Committee meets regularly (three times a year), meetings are well attended and comprise in-depth discussions on progress, barriers to progress and how to overcome them. CATIE has assigned an experienced coordinator, an assistant and a financial administrator to manage NIPN. The CATIE team meets weekly to discuss progress and issues and are in regular (daily) contact with the government’s NIPN host, SESAN, about project implementation. CATIE has developed an elaborate project management tool in Excel, which tracks goals, activities and spending, with a simple traffic light system to signal progress or issues to the Project Steering Committee. Download the Excel project monitoring template from CATIE. Government resources such as: national policy, plans and programmes for nutrition (multisectoral and sector-specific with nutrition objectives). Scaling Up Nutrition (SUN) movement UN Network online country reports and SUN country Joint Annual Assessments. UN Network/REACH supported documents: policy review, stakeholder and action mapping, common narrative or situation analysis overview and nutrition barometer. How did the study go? What were the main challenges encountered? The structures to investigate were identified based on the institutions named as “responsible” or “collaborative” in the eight commitments of the National Policy for Nutrition Security (PNSN). Questionnaires were given to the sectors, resulting in a significant loss of time. The best method is to meet with the institutions directly and carry out this mapping work with them. The necessary information was obtained after just two or three visits to each institution and only the institutions at the central level were investigated. This was a limiting factor because certain information, notably on the data quality monitoring mechanism, is available at sub-national level. Due to the sheer volume of information collected, there was an enormous amount of simplifying and restructuring work to be done which mobilised the NIPN teams. The ‘sector sheets’ were systematically created, consolidating the various elements. This led to considerable delays: instead of being finalised by the end of December 2017, the study was finalised in May 2018 and pushed forward until February 2019. How did you use the results of the study? Firstly, the study provided objective information about the multi-sectorial data available. The results allowed us to draw up an initial list of indicators available in each sector in an Excel file. The indicators selected for the NIPN. Following the data mapping, it became apparent that there was an urgent need to put together a referential database of NIPN indicators. In fact, in Niger there is no existing framework providing an official list of the multi-sectoral indicators for nutrition. We are working to adopt nutrition-sensitive indicators in each sector. These indicators will serve as a basis for the NIPN platform. Taking into account the institutions’ capacities, we decided to recruit ‘Sectoral Study Officers’ for four months. The ‘Sectoral Study Officers’ also make it possible to strengthen capacities in each sector and build relationships that will facilitate access to multi-sectoral data at a later stage. Visibility of a specific organisation, project or initiative can be created by using their logo and acknowledging their contribution in the different communication events that are being organised. For instance during a launch event of NIPN in a country, the logo of the implementing organisations and the donors should be displayed, and if available the logo of the NIPN (either the global NIPN logo or the one which has been created specifically by the country NIPN). The NIPN countries which receive funding from the European Union are requested to develop a visibility plan following specific EU guidelines. Communication and visibility are not the same. Communication is about specific messages that one wishes to convey, to achieve a well-defined objectives, reaching specific target audiences, using appropriate communication channels and tools. A communication plan is more elaborate, but can include a specific chapter on how it intends to create visibility for the NIPN. Creating a specific identity and branding for the NIPN, including the design of a logo and the use of consistent templates/formats for reports and presentations, is part of the visibility plan. How to do a stakeholder analysis? It can be very useful to do a stakeholder analysis of the overall nutrition audience to better understand which actor has which attitude towards the project and how influential that person is. Someone who is very positive and influential could become a champion for the project in the communication approach, whereas someone who is largely negative about the project’s approach, but also influential needs to be managed carefully and communication with this person should be geared towards changing her/his attitude from negative to neutral. If a person with a negative attitude is perceived as having very limited to no influence, less efforts need to be made to communicate with him/her. A stakeholder mapping is usually done along 2 dimensions: the level of interest in the topic/project (negative to positive) and the level of influence or power the stakeholder has in the target community (in the case of NIPN, the multisectoral nutrition system).